The Decision has been made, the ball has been rolled out and the first week of the NBA season has been played. So what did we learn about the much hyped Miami Heat after their first 5 games? I’d suggest very little, with an ugly opening night loss and 4 subsequent blowout wins doing little to reveal the true character of the team. 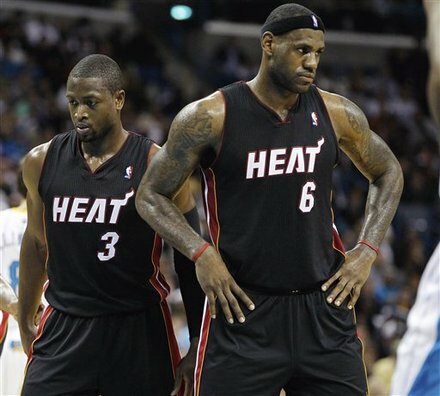 Which Heat player has the greatest desire to take over the game? How well would the Big 3 work together? Who plays the point guard role? Who will do the dirty work? Who ultimately takes the last shot with the clock winding down in a one possession game? Well, we finally got that close game yesterday when the Big 3 battled the New Orleans Hornets. Miami played catch up for the entire match, with Chris Paul being the game’s puppet master. However, entering the final stages you sensed the Heat would make a charging comeback (this will undoubtedly become a recurring feeling throughout the season) and they gave it a good crack. The basic story of the first 3 quarters summed up in one picture. 6:15 Wade drives in from the corner for the layup plus the foul – already at this point you can tell his mind is on nothing but the comeback. He has the serious face going, meaning there’s no mucking around from the artist formerly known as Flash. 5:52 Never one to shy away from a shot in the clutch, Haslem hits a jumper from the free throw area. It’s his bread and butter shot. 5:33 Okafor with an offensive rebound. 5:16 On a broken play LeBron makes a beautiful pass straight down the pipe to Haslem who is fouled on a dunk attempt. The commentators mention that Wade & James have a brief argument afterwards on how the play should’ve panned out. While Haslem converts the freebies we see James angrily jawing at his coaching staff, while Spoelstra – within earshot – remains crouching on the sideline staring directly ahead. To me this is one of the most intriguing moments of the game. LeBron will no doubt be booed relentlessly in every opposition stadium and perhaps the never ending stream of hatred he receives is a reason behind his increased agitation late in this game. He’s lashing out now at the guys who are on his side. Is this a portent of forthcoming conflicts and power struggles with his teammates and coaches? Or is this just a reflection of Miami’s early season imperfections? 4:35 As we go further into crunch time, LeBron plays the role of point guard and initiator in the half court set. How comfortable is he? Well, on this occasion he goes for a wild drive into the lane and and proceeds to pass it high and wide of a teammate in the corner. It’s something that’s become a familiar sight early on in the season. 4:30 An offensive rebound by David West. 4:13 Wade hits a stepback 3 from the corner. Uh-oh, we’ve seen this plenty of times before – Wade suddenly nailing 3′s in crunch time. I’d like to see Wade’s 3pt % in the final 6 mins of a game. Every outside shot of his seems to magically find it’s target when the stakes are high. 3:34 Wade dances around at top of a key for a while, before launches a 3 and is hit on the forearm by a valiant Belinelli. At this point in the game Wade is in takeover mode and appears to be Heat’s undisputed go to man. He makes all 3 free throws. Bosh and Haslem are undoubtedly the right big men to play at the end of a close game but rebounding is an area where Miami might be exposed. Bosh can’t keep Emeka off the glass and will end up with a grand total of 1 rebound for the game. Haslem has the heart but not the height nor the strength. This rebounding gig is harder than it looks. 2:58 Following a Hornets miss, the Heat have the momentum and a chance to take the lead. As Lebron dribbles up court the ball is slyly picked off from behind by master thief Paul. You could say this “LeBron James as point guard” thing still needs a bit of work. 2:32 Okafor continues to have the game of his life, and not for the first time in the game he flips one in just as a the shot clock buzzer sounds. That amazingly makes it 12-13 from the field for the big man. In related news, Chris Paul is his point guard. 2:16 Dwayne Wade, still acting as the Heat’s alpha male, doesn’t even consider passing the ball and goes for another patented late game 3. The kind of shot that will make you shake your head in amazement if it falls. Somewhat surprisingly it misses and I shake my head in disapproval instead. 2:08 Paul crosses James Jones over badly, making Jones look like he’s just stepped off a Gravitron as he falls to the deck. Unfortunately for Paul, he gets called for the charge as he crashes into ultimate team man Haslem. He’s an important cog is Udonis. Paul punches the air in anger at the call, and with this season’s new draconian laws seeking to protect the air from unnecessary violence, Paul promptly gets called for a tech foul. He continues to go coast to coast, draws the foul and almost gets a 3 point play. 0:59 LeBron is fouled on another drive (go figure) and hits 2 free throws to put the Heat up for the first time in the game…I start to wonder if James has decided that it’s his time to take over now. 0:50 James Jones is caught watching Chris Paul, allowing Marco Belinelli to catch a pass and drive right past him. Paul is downright confusing defenders at this point. Miami’s lead was fun while it lasted. 0:35 The most important Heat possession of the game. Down 1 with under a minute left. This is where the important questions are answered and the next 15 seconds reveal a lot. LeBron dribbles past half court and instantly passes to Wade who works the right elbow pick and roll against Bosh for our first light bulb moment – the biggest play of the game and the coach calls for a Bosh/Wade 2 man game. You can tell Wade wants the shot, but he’s double teamed by the roller so he passes it to James Jones who wants no part of the action and gives up the rock to Bosh without hesitation. Upon receiving the ball Bosh, no doubt thinking “Umm, I’m not supposed to have this guys”, plays hot potato and gives it to Wade, who in a frenzy goes baseline and delivers a poor bounce pass in traffic eventually resulting in a turnover. Wade was assertive, Bosh knew someone else should make the decisions, while James could only watch on helplessly from the weakside. 0:14 Paul drives to the middle of the painted area. He attracts the Heat players like a magnet as all 5 unwittingly form a ring around him. Paul spots an open Ariza in the corner who promptly nails a 3 point dagger. Miami may have the big 3 but arguably the best Point Guard in the league has just given them a lesson in decision making. 0:07 The next possession is basically a carbon copy as LeBron drives within 3 feet of the rim with Hornets players surrounding him like mosquitoes attracted to the flame. He decides against shooting it – those Magic Johnson instincts kicking in again? – and this time he definitely makes the right decision (with a lower case ‘d’) as he finds a wide open Bosh, who, with no time to think about anything else (probably a good thing) coolly knocks down a 3 to cut the deficit to a single point. 0:00 The final play of the game. The Heat down 3 points with 7 ticks on the clock and another chance for them to answer the questions they miserably failed only 30 seconds prior. As James Jones looks to inbound the ball, LeBron cuts harmlessly to the far corner – the play doesn’t seem to be designed for him. Unthinkable as it may sound, LeBron’s role on this, the ultimate possession of the game is just to get out of the way and space the floor. Instead, the inbounds pass is fired to Wade who instantly squares up behind the 3 point line, rises up for the uncontested shot and…passes it to Eddie House??? Huh? Dwayne that shot was yours for the taking, all day every day! As House launches the final shot, LeBron and Bosh stand alone at the 3 point line simultaneously leaning forward as if physically willing the ball to go in. In stark contrast, Wade, still smelling of desperation, refuses to give up on the play and immediately goes to crash the boards against 3 Hornet rebounders. A futile attempt, yes, but an admirable one nevertheless. Of course House misses the tough 3 and Miami go away losers 93-96. Till the very end there was still a sense of unorganised, scrambled desperation emanating from the Heat. Wade, who usually has a one track mind in crunch time makes his 2nd dodgy pass in the 2 most important possessions of the game. With the Heat struggling to mesh, perhaps he was burdened with an overbearing responsibility to get everyone involved. But unlike LeBron, at least he was the one willing (or is that chosen?) to make the decisions at the end. Good write-up Hans. I’d only add “Too Soft” to Bosh’s summary. To answer this: “I’d like to see Wade’s 3pt % in the final 6 mins of a game”…82games tracks stats in the last 5 minutes of close games. Wade’s 3PT% in that scenario was .292 and .281 in the last 2 years respectively. Which looks pretty bad, but considering they’re all basically pull-up 3′s at speed, it’s not too shabby. I’m regretting trading CP3 from my fantasy team for Bosh/Durant even more. i saw this game and pretty much agree with everything you wrote. why Wade passed that shot to House I’ll never know… House was barely open. thing is, no matter what Miami do down the stretch of a close game, either Wade or Lebron is going to appear “deferential”. there’s no way they can both be The Man. and on Wade, i think his 3-pt shot has really improved this season. but given he’s been in the league 7-8 years, I’m amazed he hasn’t developed a better long-range stroke by now.